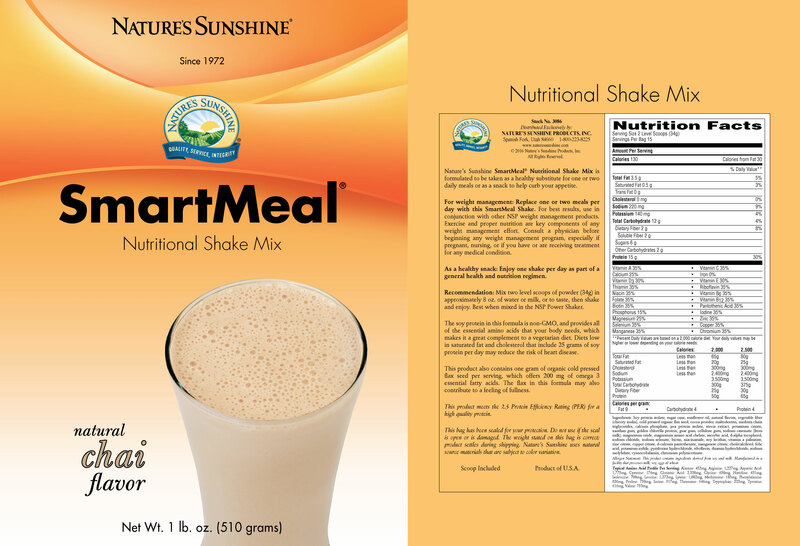 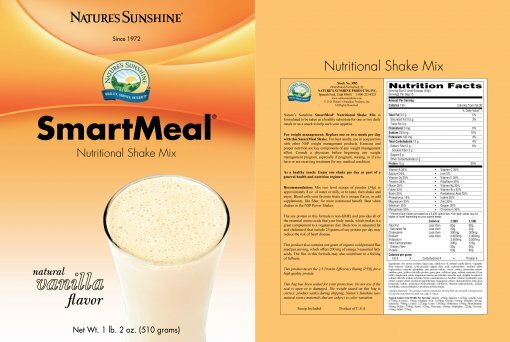 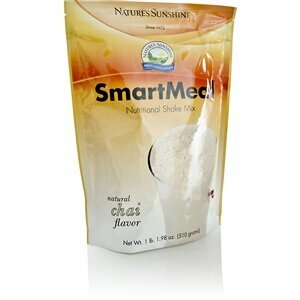 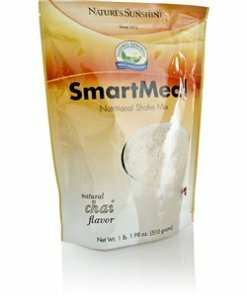 Nature’s Sunshine SmartMeal Nutritional Shake Mix is a delicious drink that can substitute a meal or serve as a healthful snack anytime during your busy day. 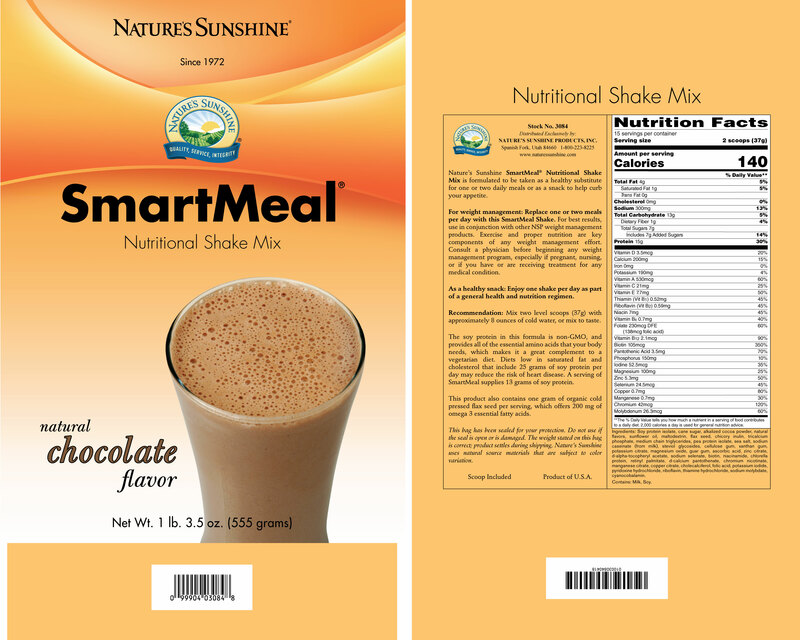 One serving of SmartMeal provides 15 grams of protein, 2 grams of dietary fiber per serving, and 35% of the recommended Daily Value for 17 vitamins and minerals, plus beneficial levels of calcium, phosphorus, vitamin D, and magnesium. Each drink is only 130–140 calories. 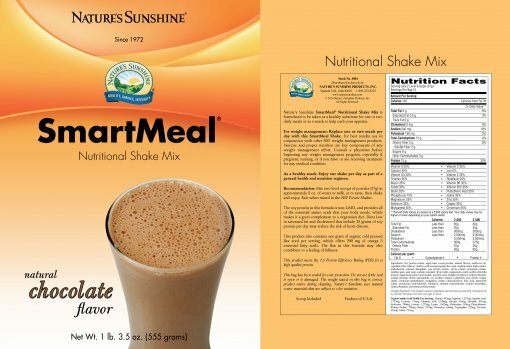 Protein Matrix (Soy Protein Isolate, Pea Protein Isolate, Golden Chlorella Protein), Sugar Cane, Sunflower Oil, Natural Vanilla Flavor, Vegetable Fiber (Chicory Inulin), Cold Pressed Organic Flax Seed, Medium Chain Triglycerides, Calcium Phosphate, Stevia Extract, Potassium Citrate, Xanthan Gum, Guar Gum, Sodium Caseinate (from milk), Magnesium Oxide, Magnesium Amino Acid Chelate, Ascorbic Acid, d-Alpha Tocopherol, Sodium Chloride, Sodium Selenate, Biotin, Niacinaminde, Soy Lecithin, Vitamin A Palmitate, Zinc Citrate, Copper Citrate, D-Calcium Pantothenate, Manganese Citrate, Ergocalciferol, Folic Acid, Potassium Iodide, Pyridoxine Hydrochloride, Riboflavin, Thiamin Hydrochloride, Sodium Molybdate, Cyanocobalamin, Chromium Polynicotinate. 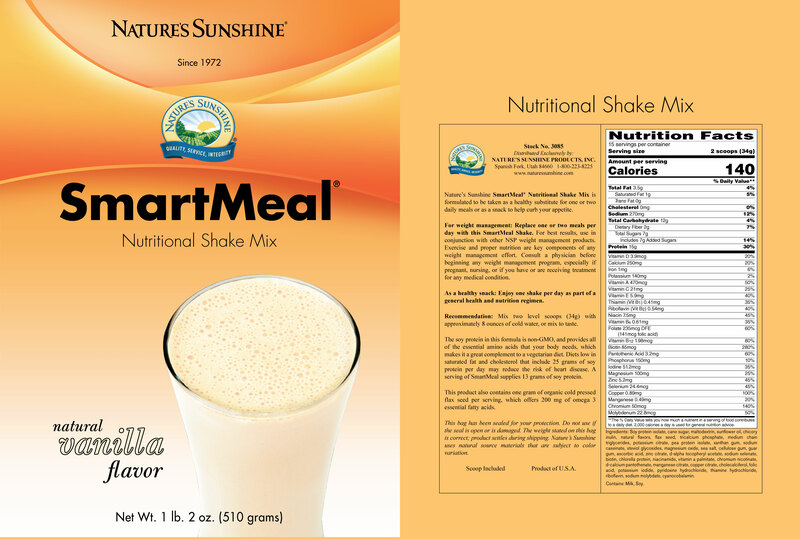 Instructions: Mix two level scoops of powder (37g) in approximately 8 oz. 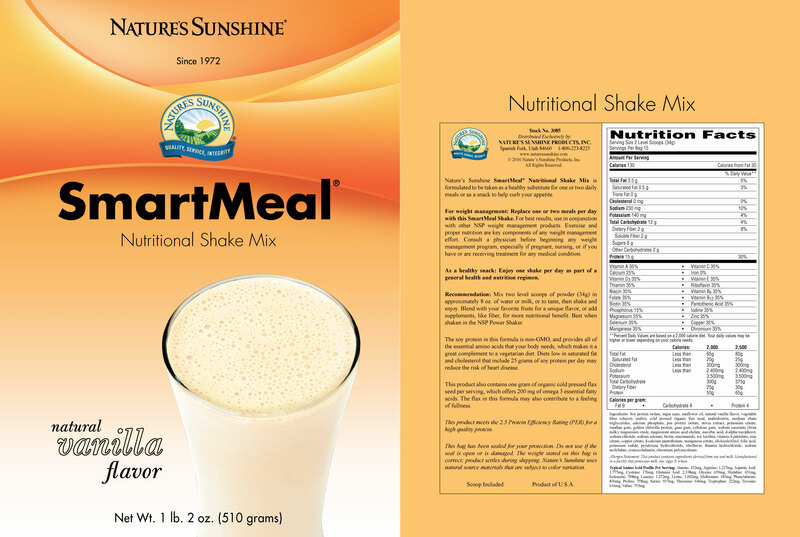 of water or milk, or to taste, then shake and enjoy.